Liza, my Samsung Galaxy S 5, keeps telling us that we are getting closer to Bryce Canyon National Park in miles but falling further away in time. We realize that we are approaching a massive 10 mile back up on Interstate 15 and there is no way around it. It’s only May, but its 100 degrees in Baker, CA which doesn’t help. We are driving from the Santa Ynez Valley, CA after a fantastic week of cycling with friends, to Utah on our quest to visit all 59 Parks. Finally, after 12 hours of fairly miserable driving through non-scenic desert, including Las Vegas, we arrive at dusk just in time for dinner at the historic Lodge near the rim of the Canyon. A friend warned us that, “the Utah Parks are a lot of red rocks”, implying that all six Parks are very similar. As we walk the short distance from our cabin out to the rim of Bryce Canyon, we get our first glimpse of something very unique and magical. I immediately know this is hardly a place of just red rocks! The Canyon is not a real canyon; it isn’t carved by a river or stream. Centuries of erosion from heavy rains artfully sculpts the red rock initially into fins, the square pillar shapes closest to the rim. Frost–wedging carves windows in the fins. Continued erosion collapses the tops of the windows creating the bulbous spires called hoodoos and finally the spires are reduced to rubble on the Canyon floor. At nearly 8,000 feet, Bryce Canyon is the top of the Grand Staircase created by massive tectonic plate activity millions of years ago. Extreme weather and temperature fluctuations create this mesmerizing landscape. The Park was established in 1928 after the railroad made it accessible. It’s named for Ebenezer Bryce, a Mormon pioneer. 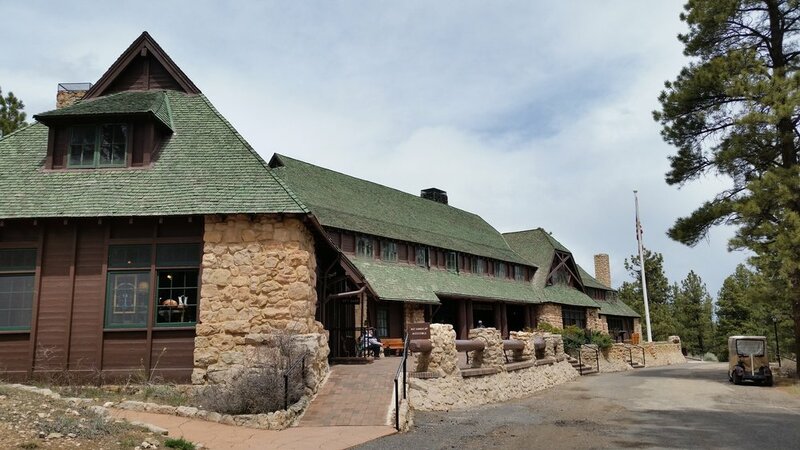 It has the oldest unaltered historic lodge of all the Parks. Food is fair. The renovated log cabins are lovely, which, unfortunately, is where I spend most of my time in bed, the first of many, due to illness. Tom can’t wait to get into the Canyon after our initial morning peek along the rim. As an afternoon introduction, he descends down to the Canyon floor among the towering hoodoos via the 3 mile Queens Navajo Loop Trail then does the steep 600 feet walk out. After caring for me last night, Tom is anxious to rise early and hike the fantastic 8 mile, Fairyland Loop Hike which begins with a 2.5 mile walk south along the rim. He then descends into the Canyon and walks among the tall hoodoos before climbing over China Wall, another rim, and then ascends back up to our cabin. Luckily he gets back before the afternoon thunderstorms begin, as I crawl out of bed number one and check out. And, since I am still bed bound, we cancel our plans to go to Capital Reef National Park. No lodging is available in Bryce tonight so we get reservations at the Best Western Plus, aka bed number two, in Bryce Canyon City, just outside the Park – not a bad second choice. In between check out and check in time we drive the eight miles along the rim. The viewpoints are exquisite I hear. Everyone has their favorite. Unfortunately, I need to stay in the car; it’s the maiden voyage of my new, used Audi A4 Wagon which is fun. Visitor center and Park stamp accomplished, we head to the hotel and then to dinner at Bryce Canyon Pines, rated on Trip Advisor as the best in town. With an early start, the following day, we explore Escalante, a super scenic side trip. 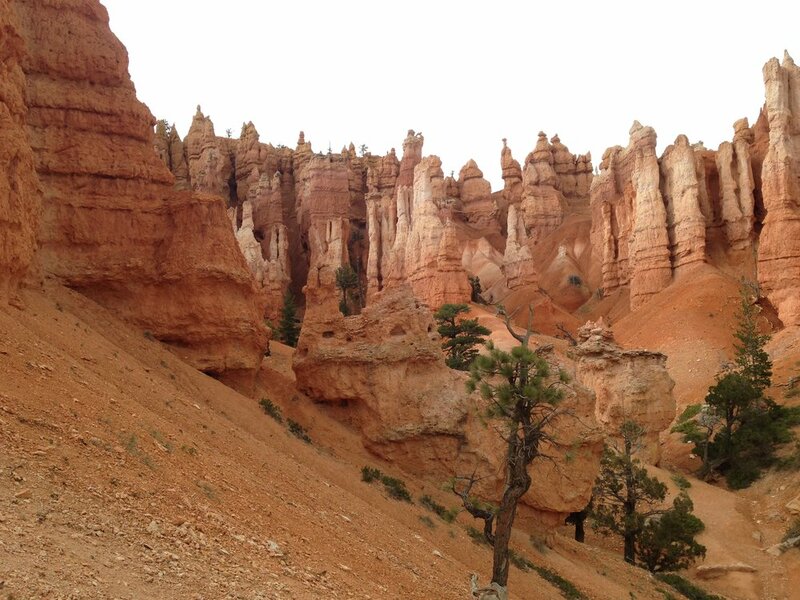 Tom, my four wheeling guy, decides we should try the dirt road to get from Bryce to Zion. Signs warn of slippery and unpassable conditions if wet. But, we of course, keep proceeding even through a stream. Finally, my savior shows up. A car coming from the other direction flags us down and tells us that 360s and side slipping are in our future if we continue. So, finally we get to turn around. Good news! I won’t total two cars in one month – the reason for my “new” car. Bad news! This detour delays me from getting into bed number three. As we enter Zion via the east entrance, I simply can’t believe what I am seeing. In all our travels I have never seen anything quite like the magnificent rock formations. The Checkerboard Mesa, with its crisscross pattern, is my favorite. We stop at the overlook right after going through the Zion Mt Carmel Tunnel built in 1930 - spectacular. I am so happy to be here! These aren’t really red rocks either, they are gray sandstone. 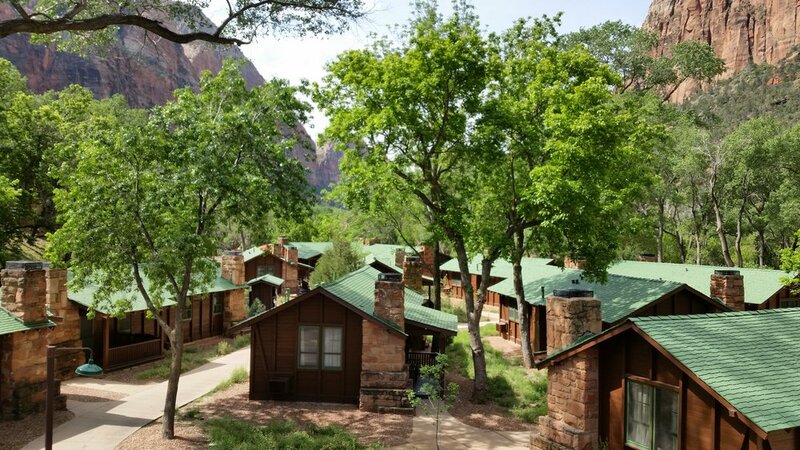 The small lodge is nestled in the Valley surrounded by cabins, cottonwood trees and detached hotel type buildings. It was re-built after a fire in 1966. So, while very nice, it’s not really a historic lodge. We finally arrive at bed number three, a hotel room on the 2nd floor which includes a deck with rockers, my favorite, and a valley view. Dinner outside on the deck of the Lodge seems pleasant for the short time I am there – all the crowds are gone. The food appears to be very good. Today is the big day; I am going to get out of bed and try a short hike. I select the Emerald Pools Hike. It’s very crowded! Even though I walk slowly in the hot sun at altitude, it feels good to be up and out. 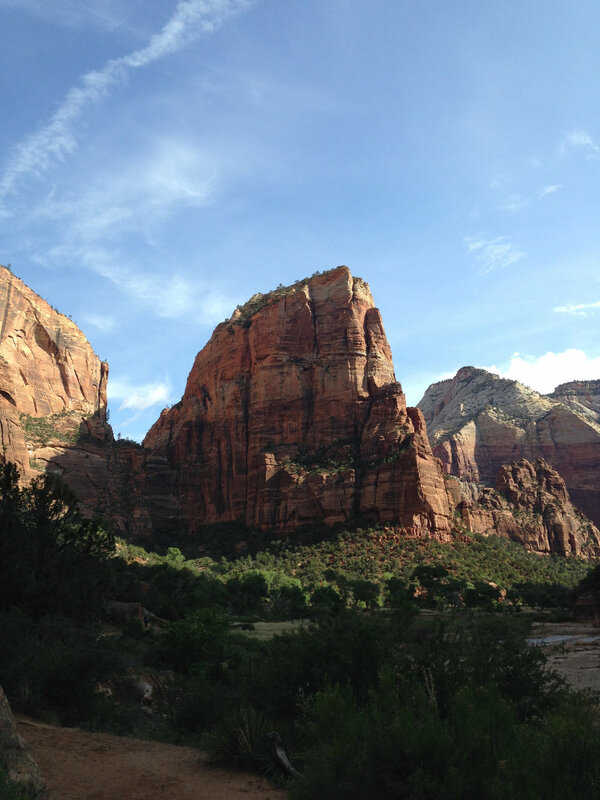 Meanwhile, Tom decides to conquer the famous Angels Landing Trail. One begins by taking the Shuttle to the Grotto stop, crossing the Virgin River and then going up, up, up, per Tom, a rock face prior to beginning the highly photographed Walter’s Wiggles. Named after the first Superintendent of the Park, the 21 switchbacks were built to enable horses to access Cabin Spring. They end just 500 feet below the Landing. While Tom is not afraid of heights, even he decides to skip the last 500 feet with massive drop offs on either side. He seems quite happy with the hike as we meet on the lawn back at the lodge! Hiking the Zion Narrows, the narrowest section of Zion Canyon, in the Virgin River is a must see or do. We take the shuttle from the Lodge and get off at the last stop, after our morning hikes. 1.5 miles on a well maintained trail along the River gets us to the beginning of this unique hike. It is fun to see but fairly crowded and one needs the right gear. Once again, we must move to another room, bed number four. It’s a cute cabin but not nearly as nice at the hotel. Packing and unpacking is getting old, even in Paradise. We get up and check out a little sad to be leaving such a fantastic place. We exit the Park through the South Entrance and head to the Kolob Canyons section of the Park. Much less crowded, the scenery is as spectacular as the main Valley. This would be an excellent place to hike but it just doesn’t fit our schedule this trip. As we depart and head northwest the scenery subsides. In about three hours we are in flat land covered with sagebrush as far as the eye can see. We begin to wonder what a National Park is doing out here. We stop at the first of two sparsely visited visitor centers in Baker, NV. 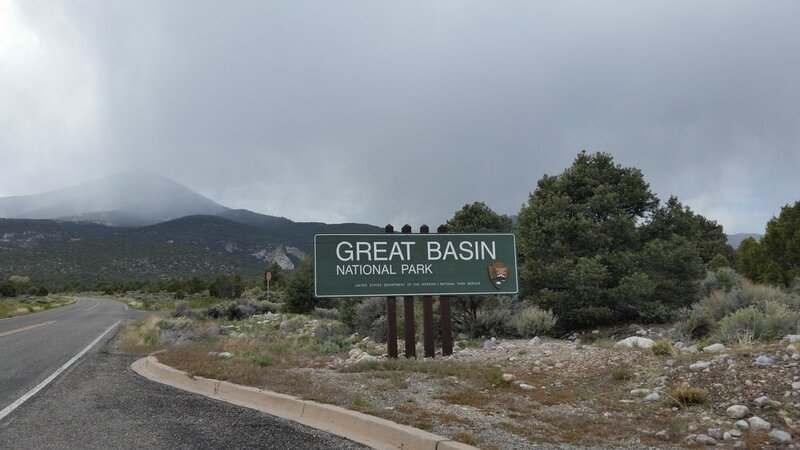 All we learn is that this is a small portion of the “Great Basin”; watersheds drain into the Basin instead of flowing out to the oceans. That’s it? That’s why there is a Park here? Oh, and there are some small caves too. By the time we drive up to Mather Overlook which looks down on a small creek and more sagebrush, I have the giggles and can’t wait to leave. It’s the shortest time we have ever spent in any Park. On top of all that we have to sleep in Ely Nevada, bed number five. The best motel in town is the La Quinta and the best restaurant in town is the worst Mexican restaurant ever. A brief driving tour of Ely confirms that we will never be coming back. 30 Parks down and 29 to go; we are officially halfway – this place is definitely anti-climactic. We wake to a snowstorm! Even though we fell in love with Bryce and Zion, I am so happy to be headed home. The white out abates in about an hour and another 11 long hours gets through Nevada, southwest Idaho, northeast Oregon and southeast Washington to Ellensburg where green begins to re-appear. As we drive the final two hours through the Cascades and over Snoqualmie Pass, I am totally conflicted. 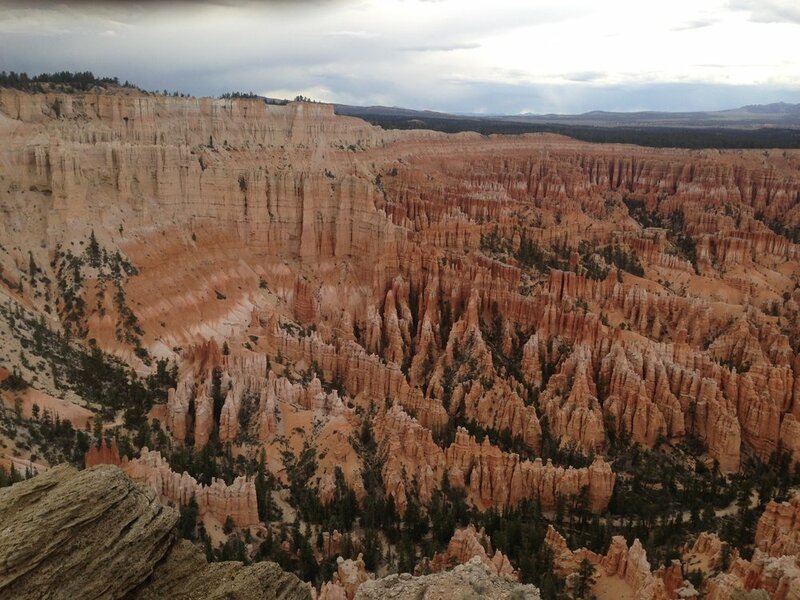 I can’t wait to get home to my own bed, but I am also daydreaming of the day I get to go back to Bryce Canyon and actually hike among those fantastic hoodoos. Addendum – One week after our return, I am totally healthy.